Peer review at ScienceOpen is surprisingly simple! Peer review at ScienceOpen is all about post-publication*. Along with nearly 12 million full text Open Access (OA) articles and article records, we also have the original publications from our journal ScienceOpen Research. Of these, the vast majority have 2-3 peer reviews each, thanks to a mighty effort from our Editorial office in Berlin. But did you know that anyone can review any article they want on ScienceOpen, and not just those from ScienceOpen Research? And perhaps more importantly, anyone can invite anyone else to review any article? That sounds an awful lot like the daytime job for Editors at traditional journals.. But with the power firmly in the hand of researchers and their communities. How cool is that? It’s super easy to implement too. 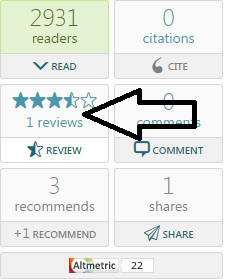 All you have to do is go to an article of choice, click the ‘Reviews’ button (Step 1), and then select the ‘Invite to Review’ button (Step 2). If you were feeling inclined, you could review the paper yourself too! You can then simply select their ScienceOpen username (what, you don’t have one yet?! ), or invite them by email (Step 3).